How in the world does this planet have insane 5400 MPH winds? 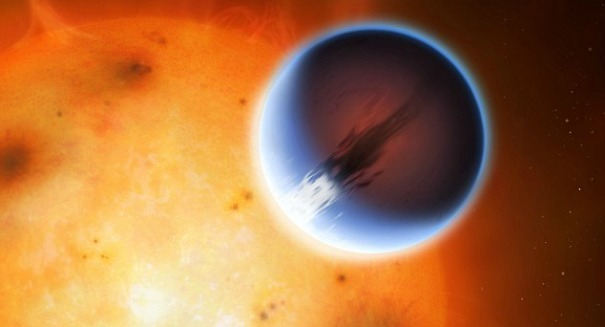 The astonishing discovery of an exoplanet with winds many time the speed of sound is amazing scientists. It is a truly breathtaking discovery: scientists have found an exoplanet with winds racing around the planet at 5,400 miles per hour — but just how is this happening? As we recently reported, this new finding is 20 times faster than the fastest wind speed recorded on Earth, which was a gust of 253 miles per hour measured during Cyclone Olivia in 2006. This finding is a major breakthrough, in that its the first time scientists have ever mapped a weather system on an exoplanet. The planet is called HD 189733b. And it’s not just the winds, the planet is also ridiculously hot because it is so close to its star, boiling at 1,200 degrees Celsius. But just how in the world are such extreme conditions possible? It’s because of how close the planet is to its star. The planet is a gas giant that is slightly larger than Jupiter, but it is also 180 times closer to its star than Jupiter is. With so much energy being blasted at the planet from close range, the winds on the planet are going to be extreme. And it’s not just the fierceness of the energy, but the extreme shifts in temperatures, as the day side reaches 3,700 degrees Fahrenheit but drops to a balmy 3,200 degrees on the night side. Wind is driven by differences in temperatures, so a sudden shift of 500 degrees is going to result in some extreme turbulence. As scientists learn more about planets like this, it could help them map out other weather systems on other planets in the future, and hopefully lead us one day to life on another planet.